When I started my career at the DAHLC, I’ll never forget the time I met my first prenatal client. I began thinking to myself, what exercises are safe? How am I going to work around this growing belly? So many questions and I was very curious to learn more! The more I kept reading, the more fascinating it was. I enjoyed learning about all the changes the body experiences to create another little human. I have been working with the prenatal population for the past 6 years, and I couldn’t feel more honored to be a part of their pregnancy journey. Pregnancy is an amazing time in one’s life. It is a time filled with many physical and emotional changes. There can be many discomforts during pregnancy – hip and back pain, swelling, to name a few. The great news is moving can help ease some of these discomforts. 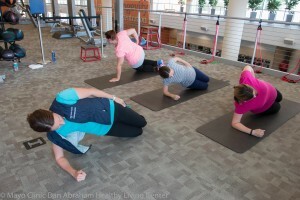 When I was pregnant with my daughter, staying active helped me better manage pelvic and low back pain. Staying active during pregnancy not only benefits mom but also baby. 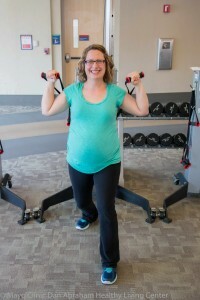 I’m an advocate for strength training during pregnancy. Including 2-3 days of strength training during your week can help you feel strong and confident going in to labor. Many moms would agree that labor and delivery is a lot like a marathon, so why not prepare your body for the big event! Personally, I wouldn’t want to run a marathon without having some training runs in my plan. Having your muscles strong and flexible will only help during the labor and delivery process. Another benefit with having an active pregnancy is a quicker recovery postpartum. Baby will continue to grow, and the car seat and baby carrier will get a little heavier each month. Having a good strength base helps you handle the physical workload of motherhood. Not sure where to start with exercise during pregnancy? I encourage you to sign-up for one of our 6-week prenatal training offerings. You can contact me, Dudley.tiffany@mayo.edu, to find out more about session dates/times. So Mama, let’s move!! Now is the time to take care of you and baby!